We can help find your dream home! Sisters HomeLand Realty is located in The Hardy Allen House originally built in 1908. It was one of the most attractive houses in Sisters at that time. It was scheduled for demolition in the 1980’s but was saved by moving it and restoring it, now at the corner of Larch & Main. Come by and learn more about our town, coffee is always on! 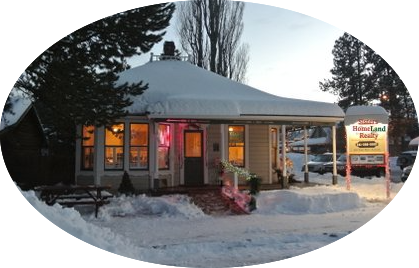 As leading real estate agents in Sisters, Oregon, we provide all the information you need to buy or sell real estate in Sisters, Camp Sherman, Black Butte Ranch, and surrounding areas.